With over 35,000 plugins available, there are few things that you cannot do with WordPress. For many site builders, the ultimate goal is to reach as many viewers as possible. Email lists are key to expanding your audience, and in this post, I’ll show you exactly how to turn your WordPress website into an email marketing machine. Launched in the spring of 2003, WordPress has emerged as the world’s leading content management system (CMS). Today, WordPress powers some 17 newly published pages each second, generating 14.7 billion pageviews every month. 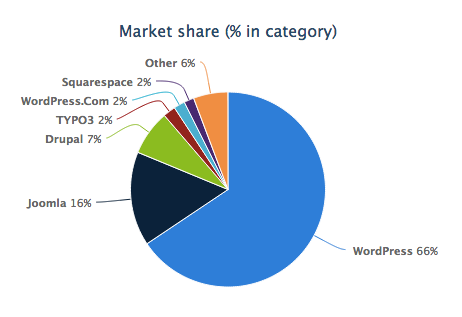 It’s the platform of choice for business websites, and 22% of all domains registered install the CMS. Marketing success hinges on your ability to reach the prospects that are most likely to benefit from your product, so you can educate them about your approach, and gradually build trust to the point where they want to do business with you. Today’s consumers have often done extensive research before considering your website’s offering. By optimizing your website for lead capture, you can make this process as inviting and smooth as possible for your audience. With an ever-growing list of quality plugins, WordPress can be tailor made for lead capture. And while there are plenty of incredible premium options, I’ve tried to stick with free options as much as possible in this guide. Plus, setting up an email marketing system doesn’t need to take all day. Each of these plugins can be downloaded, installed and configured in just a matter of minutes. Lead capture starts with getting traffic to your website. Today, there are two primary sources anyone can use to generate traffic. Google and other search engines are a powerful audience acquisition channel. When your content is properly optimized, your site will appear in relevant search results. To ensure that your site is properly optimized, a good place to start is installing the WordPress SEO Plugin by Yoast. This will help you to optimize your page content, image titles and meta descriptions so that you are more visible to the search engines. Social networks are your next target. A plugin like Social Networks Auto-Poster by NextScripts will let you automatically distribute links to your site’s content on major social networks. Once someone visits your site and sees that you offer useful information, you want to be able to stay in touch with them, so you can continue to build a relationship. To do this, you need their email. SumoMe‘s suite of free tools is designed to convert your audience into subscribers. These tools function as apps on a single plugin, so you only have to download it once. SumoMe’s List Builder app allows you to convert visitors via several types of email opt in forms. Opt in forms can be placed in the sidebar or formed into popups that invite users to subscribe after they’ve spent a pre-set amount of time on your website. While most people don’t like the idea of popups, they are indisputably effective at capturing email leads. The Hello Bar is another way to grab your reader’s attention. This is a nicely designed, versatile, fixed-position horizontal bar that spans across the top of your website. It’s also extremely powerful for capturing email addresses. As you craft your messaging, bear in mind that it’s not enough to simply ask for an email address. To effectively use any lead capture tool, you must offer readers an enticing “reward” in exchange for giving you their contact information. Sometimes just the promise of joining a branded community or receiving instant blog content updates is enough, but rich media products often convert better. WordPress is great for easily offering a downloadable eBook or special report that provides your site’s visitors with valuable, relevant industry insights. When you offer more, you can also ask for more, so use your digital download squeeze page as an opportunity to capture additional fields that can help you learn more about your prospects and allow you target them with personalized messaging. A WordPress plugin like the freemium WP Lead Plus gives even WordPress beginners the ability to create quality landing pages that convert. With more than 20 quality templates, you should be able to find a design that works for you. Another option for obtaining prospects’ details is to use a plugin like Fast Secure Contact Form to create forms for your site. These forms enable site visitors to email you questions, or to send a meeting request to talk on the phone, and you can embed the forms in your footers, sidebar or even at the bottom of articles. Additionally, you can simply redirect interested parties to a signup form hosted by your email platform, like GetResponse. You can ask customers to fill out whatever information you desire on these forms. Just keep in mind that more info might lead to a lower signup rate. It might be good to just start with First Name, Email Address, and one additional field. Now that you’ve got your purchase funnel entry points set up, it’s time to start nurturing leads via email. Plenty of free services allow you to send the same email content to all of your subscriber contacts, but to really make an impression, you’ll want to opt for a premium platform that supports autoresponders. You can send follow-up emails based on timing or client actions (or lack of action! ), birthday and anniversary emails (if that info is collected), series of emails, customized offers and more. The best tools allow you to create messages that respond to your subscribers’ interests in the perfect way and at the perfect moment. For example, Get Response’s Autoresponders 2.0 product works with user-specific tracking capabilities that allow you to send customized emails that are triggered by onsite browsing patterns. Even though triggered emails are automated, if you craft the messaging well, and set up your triggers wisely, these emails can still feel like one-on-one communication. While it is extremely important to treat your clients and prospects as individuals, that doesn’t mean that you can’t take advantage of tools like autoresponders to enable scalability. Platforms like GetResponse use well-designed APIs for easy integration with WordPress. It’s as simple as downloading the plugin and entering your API key. Maintaining an effective digital sales pipeline can be time consuming, but setting it up doesn’t have to be. If you configure your pipeline using the right integrated tools for WordPress, the initial setup should be relatively painless and inexpensive, and you’ll be in great shape to take your business to the next level. An automated sales funnel is the ultimate weapon for businesses wanting to scale.